Urban poverty and China’s globalism: what’s the relationship? Home /China, Culture and Society, Economic Reforms, Labour, Poverty/Urban poverty and China’s globalism: what’s the relationship? China’s Party chief and President, Xi Jinping, has boastfully publicized his regime’s firm intention to eliminate poverty by the year 2020, or, at the very least, to meet the fundamental needs of the country’s entire populace by that end date. The truth of the matter, however, is that he’s got his sights set not on the citizenry as a whole, but just on the remaining millions of rural indigents. Two subsets of the urban population have been overlooked entirely. The Chinese leadership has long viewed its subjects as separated into two vast conglomerates: those whose household registration is in the cities and those whose is in the countryside. Each has been accorded different treatment, making the Chinese government’s handling of poverty different from that elsewhere. This distinction dates back to a decision announced in June 1955 in a “Directive on the Establishment of a Permanent System of Household Registration.” This order had a clear purpose: to industrialize and prioritize only the urban areas, and therefore to reserve resources for those who were registered there, while checking geographical mobility, specifically, to make it difficult and cumbersome for peasants to enter and then to subsist in cities. This ruling was reinforced three years later with definitive “Regulations on Household Registration in the People’s Republic of China” that set out procedures required for legal stays beyond three days in the municipalities. Effectively, the population was severed in two, with rural-based folk fastened to the farms, a situation not altered until China’s opening up after 1980 engendered a hunger for hands in the towns. Back in the 1950s, and for nearly three decades thereafter, urban factory workers—and, although to a lesser extent, everyone officially resident in a city–were the recipients of decent if basic urban public services. In addition, for those employed by state-owned firms, state or enterprise-supplied welfare (medical, educational, pensions, sometimes recreational) and housing, while people in the rural areas were nearly left on their own (with the exception of some rudimentary health care and schooling under the 1959-1982 commune system). But after the 1970s, when China’s leaders chose to set the country on a course of rapid modernization and economic relaxation, gradually at first, rapidly with time, tens of millions of farmers became unbound and seemingly rushed cityward, where they were hired on the cheap and treated as unwelcome and temporary tenants. Discriminatory and exploitative treatment was their lot, even as their unstinting and under-compensated labour has for over three decades enabled the nation to thrive. 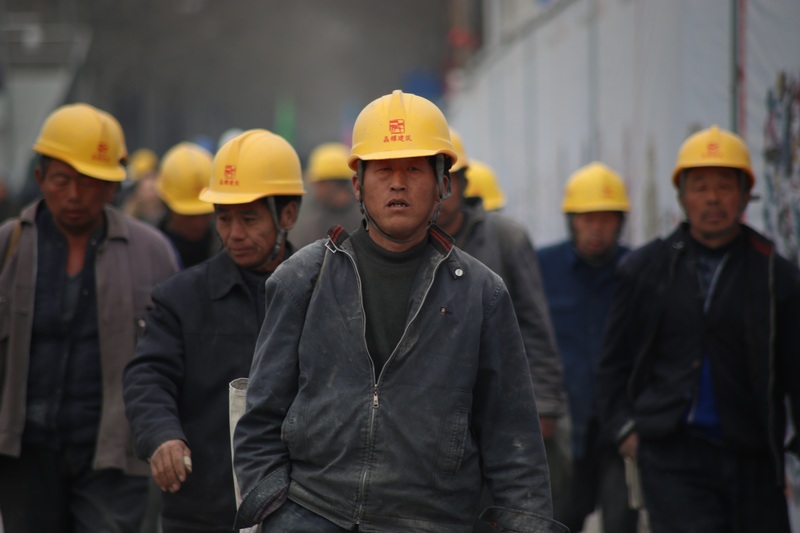 But President Xi’s project to alleviate destitution does not target these migrants. This is a group that has received much journalistic and scholarly attention over the past 15 to 20 years, and yet, remarkably, the politicians in Peking seem largely indifferent to their plight. So long as the work they perform made the country wealthy, and its recompense remained relatively low-cost, the foreign capital they have attracted satisfies those at the top of the system, such that the urban prejudice directed against them has been officially ignored. The November 2017 mass destruction of their working and habitation sites in the capital, accompanied by forcefully chasing them out of Beijing, only underlines the timelessness of the animosity toward these sojourners. This is the first group whose situation is not to be addressed by the plan to wipe out penury. The other social segment whose poverty will not be considered or attended to are those who were held to be the “masters” of society in the era of Party Chairman Mao Zedong (1949-1976). These were the workers who ran the factories in the metropolises and whose level of skill and education sufficed for operating the simple technology of those days. On top of their meagre training, most of them suffered a deficit in schooling, as the 1966-76 Cultural Revolution shut down all institutions of learning for much of its run. With China’s turn outward following Mao’s death, what was once viewed as the worth of these manufacturing drudges became instead their curse. These people, their abilities, and their output were plainly unfit for the global marketplace. It was this inadequacy, produced by the party-state and its policies of the past, that drastically altered their status and their livelihood. When viewed as superfluous and backward, they lost their jobs in multitudes, the poverty that befell them, and that is ongoing today—and, likely, into the next generation—is closely linked to the nation’s push to enter the big-time economy of international capital and competition. President Xi’s failure to turn attention to the predicament of these people, or to aim at the amelioration of that predicament, is inextricably tied to the global involvements and pretensions of the elite of recent years. These people are destined to stay put at the base of the social hierarchy in the cities. It is no exaggeration to claim that China’s global connection has begotten both the birth and the behaviour directed at what has been termed this “new urban poor.” In four ways the circumstances of this stratum suggest global processes and comparisons. In the first place, these urbanites were hit with poverty all of a sudden in the late 1990s. Perhaps as many as 60 million workers over the age of 35 (considered “old” in that context!) were let go by their enterprises by fiat at one stroke as China prepared to enter the World Trade Organization. At that point, the country’s leaders confronted how out-of-date firms, using obsolete machinery and already falling into debt (as they tried to meet a challenge from enterprises not covering workers’ welfare), were apt to fail in droves on the global market. The response was to encourage massive bankruptcies and mergers that eliminated what for decades had been secure positions. As forsaken factory hands surged to the streets in protest, the frightened leadership devised a “minimum livelihood” allowance, explicitly aimed at tranquillizing the workers. But, secondly, unlike cash transfers in many other parts of the world, this scheme was unconditional; families got the tiny sums allocated to them without having to ensure that their children saw doctors or went to school. The upshot was that the poverty visited upon the parents was passed along to the children, almost as if the regime has been content to keep these people barely alive, sacrificing them without any plan to eliminate penury for the succeeding generation. In much of Latin American and in some Asian countries, by contrast, the conditions placed upon these subsistence grants offer hope for elevating the productivity and prospects of the progeny; perhaps in China, with its immense population, these young people are just to be sacrificed like their parents were. A third dimension of the government’s disposition of the now destitute that has a global reference is that state practices discourage the presence of the poor in the streets; it appears as if they are deemed to constitute a shame before the world, just when China is attempting to present a fully modern visage. So, unlike in the case of the rural poor, whose condition can be managed by upgrading infrastructure and services across regions and districts and showcased with a new facade, the urban poor are neglected because bringing them out of poverty is a much more complex job. And, finally, the programme of minimum livelihood was created to allow enterprise reform to progress smoothly, and also, explicitly, to forestall the protests that were thought capable of scaring off foreign investment. Once the dispelled workforce was quieted down with meagre funds and propaganda about China’s rise, and once it became evident that outside capital was undeterred, the government has accordingly slowly been downgrading assistance for the urban poor, even as it promulgates its supposed, and selective, project to abolish poverty. Dorothy J. Solinger is Professor of Political Science at the University of California, Irvine. Her current work is on urban poverty and the welfare program that addresses this in China. Image credit: CC by Marco Loviric/Pixabay.